The underdog's dream scenario unfolded immaculately. Against defending Class 6A state champion Jefferson in the 6A quarterfinals, Jesuit played an indispensable first half. Matt Lang was uncoverable off the bounce. Joe Wall duped the Democrat defense with clever finishes inside and deep threes. Aiden Williams' outside jumper fell despite getting all sorts of extra defensive attention. 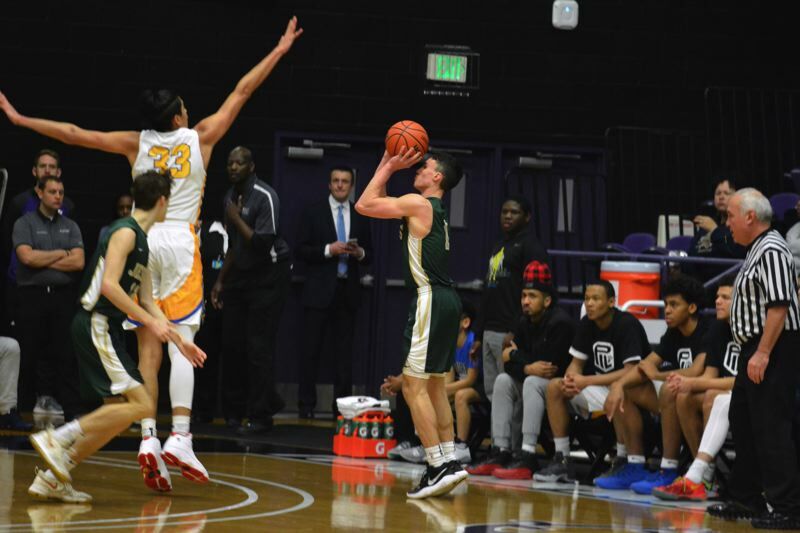 When Matthew Levis' right corner three dropped through the net late in the second quarter, Jesuit found itself even with the prohibitive state favorites, 29-29. Jefferson took a 30-29 lead into halftime, but the Chiles Center was abuzz. Jesuit, neglected by the pundits all season-long, had commanded Jefferson's attention. Ultimately and unluckily, however, what Jesuit truly did was poke a hibernating bear. Jefferson awoke in the second half, activating its lulled-to-sleep defense with unrealistic length, timing, anticipation and activity. With Kamaka Hepa and Khalil Chatman roaming the paint like a pair of Dobermans and Robert Ford and Keylin Vance patrolling the perimeter, Jefferson held Jesuit to just 24 percent shooting in the second half and roared away with a 63-48 win over the Crusaders on Thursday. Even with the loss, Jesuit's first 16 minutes of action had Jefferson on edge. 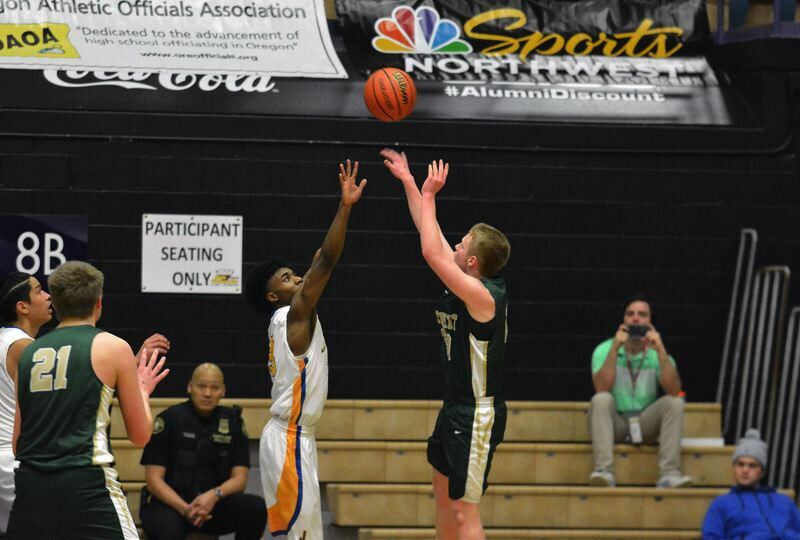 For a half, the Democrats teetered and with Jesuit's ability to get hot from behind the three-point line there was a belief the Crusaders could sustain its excellence into the second half. "We came out fearless," Jesuit junior point guard Will Sheaffer said. "Everybody was shooting the ball, playing defense. We didn't give them any respect. We just came out like it was another day at the office. Everybody in the locker room felt confident that we could take these guys, that we could beat them. Our only expectation was to come in and win, but it didn't go our way today." Lang, who played with Hepa last spring and summer on the Portland Basketball Club, lit up the first quarter. The southpaw drilled a three that brought Jesuit within 10-7. Then the senior dropped a left-to-right crossover along the baseline for a reverse layup. On the next trip down Lang deployed a left-handed hang dribble froze that Ford and slung past the Democrat defense for two. Sheaffer made two free throws at the line that tied the game up at 13-13. Jesuit earned Jefferson's respect in the first half, something that isn't easily obtained, especially for a team that hails from outside the Portland city limits. "We bank on work ethic and our determination every day," Sheaffer said. "We're going to go at everybody the same way." As Jefferson centered its defensive attention on Lang, Wall and Williams found a groove. Williams sprinted off a dribble handoff from Wall on the left wing and sprayed a three to start the second quarter to give Jesuit a 16-15 lead. Wall wheeled inside for a bank shot in the middle of the key over Hepa and swished lofting step-back three that gave Jesuit its biggest advantage of the game at 21-15 with 5:53 to go in the second quarter. The momentum, the energy, the good vibes were flowing toward Jesuit, who played off its crowd's passion and used it as coal to fuel its fire. "The excitement was crazy," Sheaffer said. "The student section was rocking. Everything felt so good. We thought we run away with the game right there." Wall helped down on Hepa, stripped the ball away, weaved through the Democratic transition defense, created contact with Chatman and finished with the left hand, plus the foul. Wall finished the and-one to give Jesuit a 26-23 lead. At the start of the third quarter, Wall spun off Chapman and pulled up for three at the left angle to reclaim a 32-30 lead. The Crusaders' pipe dream lost strength the rest of the way, however. It wasn't as if Jesuit couldn't create offense or coax about high percentage looks. Many of Jesuit's shots in the third quarter came within the confines of the paint. The Crusaders even found a few seemingly open three-point attempts. The difference in the second half was Jefferson's effort level. Rather than concede layups or lazily let Jesuit fire away from deep, Jefferson flew around defensively, using their athletic gifts and next level size to affect the game in an impactful way. They contested, altered and sometimes swatted away Jesuit's hard-earned offensive opportunities. The stops and takeaways jumpstarted Jefferson's deadly transition game and sparked a 14-0 third-quarter run that gave the champs a commanding 44-32 lead. Williams came up with a four-point play with 54 seconds left in the third that brought Jesuit within 44-36, but the Crusaders went nearly seven minutes without a point to start the second half. Jefferson led by as much as 55-38 on a Jaylen Brown transition three early in the fourth. Jefferson shot 51 percent from the field as a team. Chatman had a game-high 28 points. Hepa had 17 points, 12 boards and three blocks. Jefferson had six blocks and seven steals defensively, many of which led to easy baskets on the other end of the floor. "Their athleticism in the end kind of overcame us," Sheaffer said. "We didn't really respond in the second half the way we know we could've. (Jefferson) kind of got in a groove defensively. They started using their length and athleticism to get after us, getting in the passing lanes and all that. On the offensive end, they were obviously a lot to deal with inside, especially. Jefferson is a great team, so hats off to them." Wall led the Crusaders with 13 points and Lang finished with 11. Williams had 9 points and three boards. Jesuit will play Tualatin in the 6A consolation bracket on Friday with a shot to keep its season alive. "We love each other, man," Sheaffer said. "This year has been something different, unlike anything I've been a part of before. We all have so much love for each other. Win or loss we always got each other. This is gonna stretch further than basketball. Now our goal is to win the consolation bracket, so it's next game up for us."